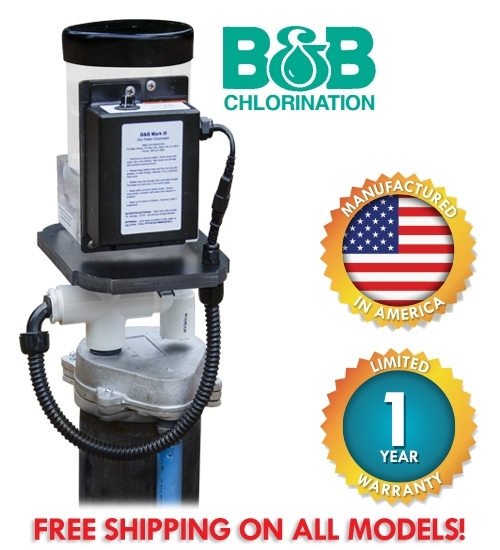 A dry pellet chlorinator is a device that mounts on the well and drops a compressed chlorine tablet down the well shaft into the well water. It is wired into the pump's electrical circuit and run whenever the pump is pumping water, metering chlorine in proportion to water usage. An adjustment mechanism accounts for variations in pump sizes and water quality. As the pellet sinks to the bottom of the well and dissolves in the water, it releases chlorine that reacts with contaminants in the well. Watch the Aqua Science service technicians install a chlorination system. Do you need one for your well? Many do-it-yourself homeowners can install this unit. Give us a call at 800-767-8731 and we can answer any questions or help you get all the the items you need.